When he was around 20 years of age, some Teutons invaded Gaul and were repelled. When he went before Emperor Julian to receive his reward, he was moved to refuse the bounty, saying ""Up to now, I have served you as a soldier; allow me henceforth to serve Christ. Give the bounty to these others who are going out to battle. I am a soldier of Christ and it is not lawful for me to fight." Julian accused him of cowardice and had him imprisoned, but he was released after a truce was called. When St. Lidorius, second Bishop of Tours, died in 371 or 372, the clergy of that city desired to replace him by the famous hermit of Ligugé [St. Martin]. But, as Martin remained deaf to the prayers of the deputies who brought him this message, it was necessary to resort to a ruse to overcome his resistance. A certain Rusticius, a rich citizen of Tours, went and begged him to come to his wife, who was in the last extremity, and to prepare her for death. Without any suspicions, Martin followed him in all haste, but hardly had he entered the city when, in spite of the opposition of a few ecclesiastical dignitaries, popular acclamation constrained him to become Bishop of the Church of Tours. 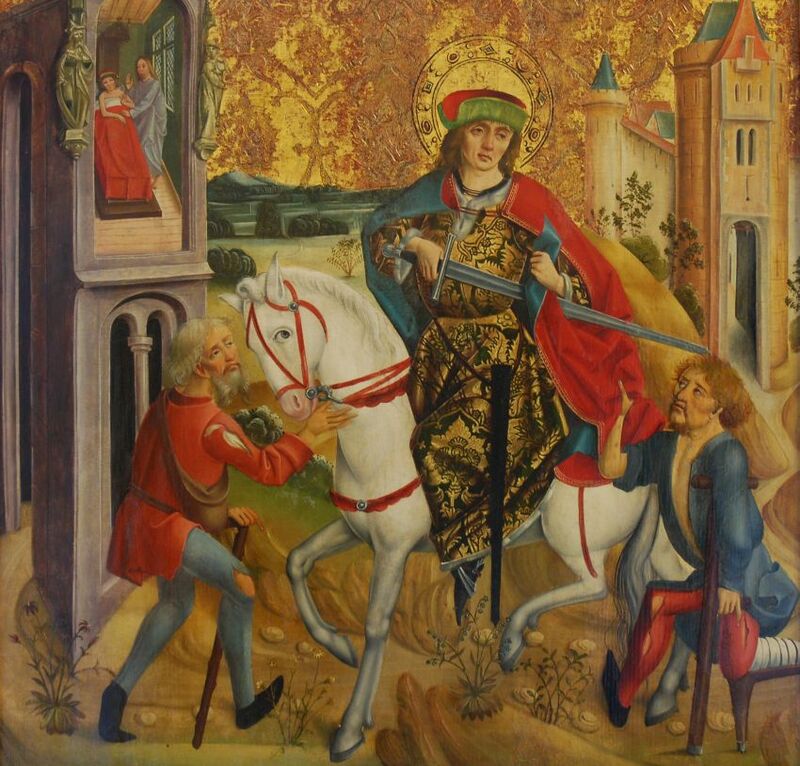 St. Martin's Feast is considered the first day of Winter for practical purposes, so, alluding to the snows of that season, the Germans say that "St Martin comes riding on a white horse." Of course, it might not feel like Winter if one is experiencing a "St. Martin's Summer" -- the equivalent of an "Indian Summer." It is said, too, that one can predict what sort of Winter one will have by the conditions of St. Martin's Day: "If the geese at Martin’s Day stand on ice, they will walk in mud at Christmas." The Feast coincides not only with the end of the Octave of All Souls, but with harvest time, the time when newly-produced wine is ready for drinking, and the end of winter preparations, including the butchering of animals (an old English saying is "His Martinmas will come as it does to every hog," meaning "he will get his comeuppance" or "everyone must die"). Because of this, St. Martin's Feast is much like the American Thanksgiving (celebrated on the 4th Thursday in November) -- a celebration of the earth's bounty. Because it also comes before the penitential season of Advent, it is seen as a mini "carnivale" with all the feasting and bonfires. As at Michaelmas on 29 September, goose is eaten in most places (the goose is a symbol for St. Martin himself. It is said that as he was hiding from the people who wanted to make him Bishop, a honking goose gave away his hiding spot), but unlike most Catholics, those of Britain and Ireland prefer pork or beef on this day. 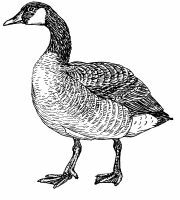 If you eat goose, save the furcula -- the "wish bone" -- from the bird's breast. Physician Johannes Hartlieb wrote in 1455, "When the goose has been eaten on St. Martin's Day or Night, the oldest and most sagacious keeps the breast-bone and allowing it to dry until the morning examines it all around, in front, behind and in the middle. Thereby they divine whether the winter will be severe or mild, dry or wet, and are so confident in their prediction that they will wager their goods and chattels on its accuracy." Afterward, the wish bone can be tugged on by a person at each end as they each make a wish. The person who ends up with the larger part after the bone breaks is the person whose wish is said to come true. In many countries, including Germany, Martinmas celebrations begin at the eleventh minute of the eleventh hour of this eleventh day of the eleventh month. Bonfires are built, and children carry lanterns in the streets after dark, singing songs for which they are rewarded with candy. And on a macabre final note, old superstitious folklore (not Catholic teaching, of course) says that if you stand in the back of the church and look out over the congregants on St. Martin's Day, you can see auras of light around the heads of those who will not be among the living at the next Martinmas. Note: In America, November 11 is also the secular world's Veterans' Day. Veterans' Day began as "Armistice Day" (initiated by anti-Catholic Woodrow Wilson and formalized in 1938), which is the anniversary of the World War I Armistice (truce) signed in the Forest of Compiegne by the Allies and the Germans in 1918.